To make a direct booking inquiry, please fill out and submit our inquiry form for the villa you are interested in, the requested rental dates and the total number of guests in your group. We’ll ensure we get back to you as quickly as possible to confirm availability and rental pricing. You can book any of our villas immediately by clicking below. For your convenience this will take you to our Airbnb listing. If you prefer you may contact us to book directly using the inquiry form. With one of the best views in Ubud, Villa Jiwa is a gorgeous one bedroom Villa hideaway for up to two people with en-suite garden bathroom and gourmet kitchen. The villa has a spacious bedroom leading to a lovely garden bathroom of terrazzo and granite featuring a rain shower. Located with a stunning view to the west and surrounded by gardens on both side it’s steps away from the pool. With the best view in Ubud, Asmara at Harmony means “Romance” in the local language and this stunning retreat is the perfect love nest for a honeymoon or singles or couples seeking absolute privacy and beauty. Villa Asmara has a huge private deck and meditation garden right on the edge of the rice fields and both sunrise and mountain views to the north as well as a panoramic vista of the terraces to the north and west. Your very own private fishpond and waterfall makes Villa Jantung a dream place to stay at Harmony. 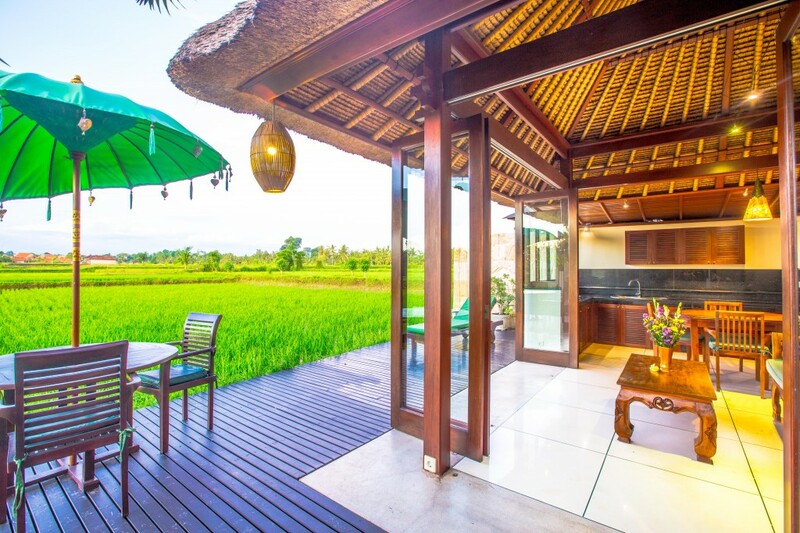 Situated with a commanding view of the gorgeous pool and deck and the rice fields beyond. Villa Jantung is a wonderful retreat for couples or a single person with a private tropical garden among fruit trees. Organized for indoor/outdoor living with an open plan living room and a full kitchen, the spacious master bedroom will give you privacy with a canopied bed and rich wooden decor. Our Luxury Two Bedroom Tropical Villa Budi at Harmony Villas has the best location and views in all of Ubud just moments from town but unbelievably quiet and peaceful. After a day in busy bustling Ubud or on a temple tour or other activities you need a place to relax. Villa Budi is the place. Your stay includes a fabulous breakfast and full staff service. Villa Sungai is just moments from bustling Ubud yet peaceful and quiet, with the best views in all of Bali. Perfect for 4 with a huge deck, gorgeous pool and right on the ricefields, it’s tropical living at its finest -“Heaven at an Earthly Price”.